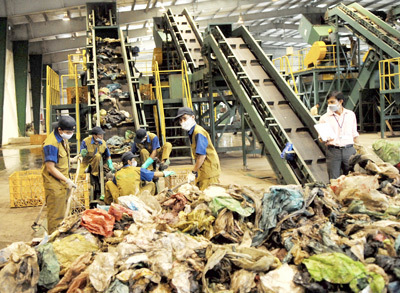 HA NOI (VNS) — Ha Noi will build nine new solid-waste treatment plants and improve the capacity of 8 existing plants in the city by 2030. The total area of the 17 plants were estimated to be built over more than 580 hectares. It is the aim of the city's plan to treat solid waste in moving towards fulfilling the vision toward 2050, recently signed by Deputy Prime Minister Hoang Trung Hai. The new solid-waste treatment plants will be located in suburban areas, including Gia Lam District's Phu Dong Commune, Phu Xuyen District's Chau Can Commune, Thanh Oai District's Cao Duong Commune and My Duc District's My Thanh Commune. As part of the plan, a forecast said that about 18,900 tonnes of solid waste would need to be processed daily in the city by 2030. The solid waste was mainly discharged from households, industrial parks, construction sites and hospitals. It was targeted that 90 per cent of the total household solid waste and 100 per cent of medical solid waste in urban areas would be collected and treated by 2030, he said. According to Hai, domestic technologies, which saved energy and protects the environment, would be preferred to be used in treating solid waste. Depending on the type of solid wastes, they would be burnt, recycled or hygienically buried, he added. However, the goal is to minimize the burying of solid waste in order to save land and reduce environmental pollution. The Deputy PM assigned the capital's People's Committee to take the helm of the plan which was estimated to cost VND11 trillion (US$522.3 million).